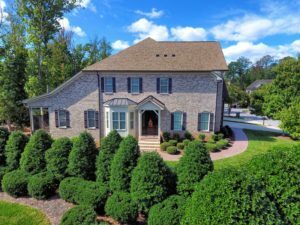 Tryon Villas in Cary North Carolina Where Classic Styling Meets Modern Luxury Living ! Walk to shopping & dining or stroll around the 11- acre lake. European inspired stone and brick exterior provides an old world charm to this exclusive luxury community. Beautifully appointed maintenance free energy star luxury residence. Each of the 4 bedrooms is an en-suite. Designer kitchen has granite, detailed custom cabinetry, range hood and tile backsplash. Family room features a stacked stone twilight fireplace that opens to a covered porch with remote controlled screen system. The first floor guest bedroom with a full bath can double as a office/study. Spacious master suite has master spa, oversize shower and expansive walk-in closet. Entry into home (at front door and garage door into house) is a 36″ space and some other doors offer 36″ entry. Lock and leave convenience is ideal for residents that travel or have vacation homes.